Snack Girl has long advocated for an apple and peanut butter for a perfect snack. Basically, you got your fruit with a another whole food (peanuts) just blended up. Super yum! Sadly, this snack can get a bit dull. Even Snack Girl herself gets a bit sick of apples and peanut butter. What would happen if you added yogurt to your peanut butter? Or more exactly, peanut butter to yogurt? Would the awesomeness just blow your mind? I have got to tell you that I added a mere teaspoon of all natural peanut butter to 2 ounces of Vanilla Greek Non-fat yogurt and my mind was blown. Actually, it was the tablespoon of PB2 added to the yogurt that was other worldly. PB2 is powdered peanut butter and has a fraction of the calories of regular peanut butter - see here: Peanut Butter Lovers: A 45 Calorie Solution That Will Save Your Waistline . You get the peanut butter flavor without the calories - and I actually liked it BETTER than the addition of regular old peanut butter. You take about half of the yogurt out into a bowl, mix it with your choice of peanut butter, and spread it on your apple. My kids, of course, prefer to dip. The vanilla and peanut butter combo is creamy, nutty, and just great with the CRUNCH of a fresh apple. Wow! Another option for a yogurt fruit dip is to just add honey to plain greek yogurt. Taste it until you get the right sweetness and you will love how it tastes on apples, strawberries, pineapple, etc. For those on Weight Watchers, if you can just divide this in 1/2 (2.5 Points+) - you will still have a satisfying snack. How do you make yogurt fruit dip? Please share. 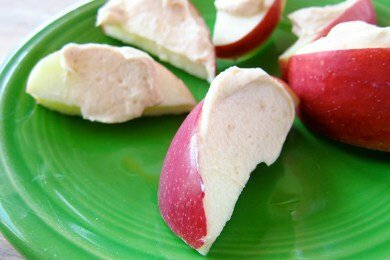 Mix yogurt with peanut butter and spread on apple or use as a dip. Enjoy! My all time favorite topping (could also be a dip), is to mix 50/50 any plain nonfat yogurt with nonfat Cool Whip. Sweeten further if needed with sweetnlow. Add a dash of real vanilla powder. Wow! For variety add a squirt of lime or lemon juice or just savor as home made whipped cream minus all the calories! I've actually done this & its soooooo good!! I just used PB2 for the first time ever in my brownies this weekend, it's not bad! I always put peanut butter in my yogurt, but I never thought of using PB2 for it instead. What a great idea! I'm going to try that today!! Have a great week! I cut up an apple and put it in a ziploc bag and sprinkle 1 Tbsp. of dried PB2 over the apples and close the bag and shake it up to distribute the powdered peanut butter. It is a great treat! I have never seen PB2 in ony of the stores around here (Southern Utah). Where can I buy it? Have you tried the PB2 with Chocolate? SOOO yummy!!! Also, I am very intrigued by the cracker Leah mentioned, I will be checking that out for sure! i JUST hopped aboard the PB2 train- that is some GOOD STUFF. will try mixing it in with my greek yogurt, thanx for the tip!! Ok, I've been resistant to the PB2 train, just because it seems so artificial to me. However, this has totally gotten my attention!! Will be ordering my PB2 tonight!! Can't wait to try this, and also the suggestion for cut up apples/sprinkle PB2 over them in a bag and shake. Sounds too yummy to miss! My friend and I did this and dipped in bananas and it was sooooo freaking good!!!! I love yogurt and peanut butter! I posted a similar dip a couple weeks ago...pretty awesome stuff! I love the idea of PB and yogurt together -- just bought PB2 and plan to try it with the chocolate version! I have a fruit dip recipe using Greek yogurt and Nutella here on my blog: http://www.hellinhealthy.com/. You will also see your onion dip reposted. Thanks again! Sounds delightful. Gonna try it with my kids today!! !